Imagine a 550-mile trail around San Francisco Bay. This is a Big Vision! Thirty years ago, William Penn Mott Jr. brought forth a big idea. As a leader in the National and California State Parks he envisioned a 550-mile ridge trail that would unite the ridges around San Francisco Bay watershed. The first section of trail was dedicated in May 1989. Today, 375 miles are open and ready to explore either by foot, bike or horseback. The vision of the Bay Area Ridge Trails is to link people, parks and open space for today and future generations. November 4 was Ridge Trail Day where 100’s of volunteers gathered to work on new and existing sections of the trail. Imagine, a 550-mile trail through wilderness and urban areas built by volunteers. Anything is possible. The vision includes trails from Mt. St. Helen to Oakland to San Jose to San Francisco to the Golden Gate Bridge to the ridges of Marin and Sonoma County. 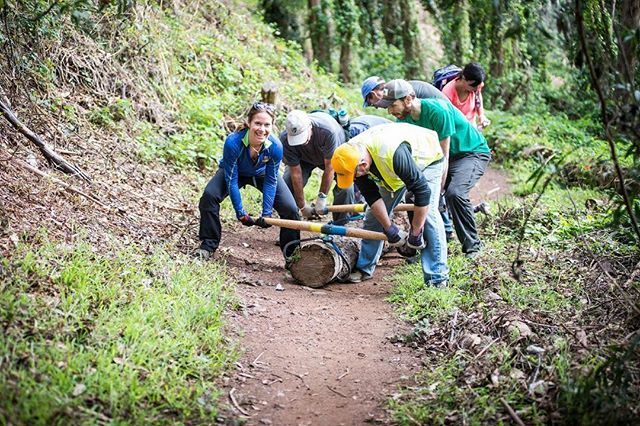 Over five hundred miles of trails is slowly being connected by a grassroots effort of volunteer trail builders, collaborative partnerships, and visionary leaders. Download the regional map and you’ll get a sense of the scope of this vision. I volunteered to work on the section of the Bay Ridge Trail in the Presidio in San Francisco. This is an established section of trail and 15 of us headed out under Eucalyptus trees to remove leaves from the trail. I envisioned hundreds of other people working on stretches of the trail with different terrains, trees, projects and views. It struck me how this vision is being carried forward through a literal army of volunteers. As strangers we united towards a common goal. The entire event made me wonder, what sparks an individual to become a part of a big vision? What makes one vision come to life while others just sit on the shelf bound in a strategic plan. Does your community or organization have a big vision? What is making this vision come to life? Is it the team? the leaders? the cause? Share your story with me. Perhaps together we can find the thread that ties all great visions together and help turn other big ideas into reality. Enjoy working on whatever big vision calls you. Anything is possible when we unite together towards a common cause.